Dartmouth is an town in Devon. A historic port location, Dartmouth's geography and seaside location combined with its traditional architecture make it an idyllic settlement popular with tourists from around Britain and the near continent. Dartmouth is on the A379 coastroad from Kingbridge to Torbay; if coming from the East it is easier to drive to Torbay and then follow the signposts, from the West, drive to Plymouth (or the Devon Expressway) and follow the signposts to Dartmouth. There are direct national coach (National Expresss)and rail links to Totnes and Paignton from London, Birmingham and even as far as Scotland. Taxis are usually available from both stations, otherwise local bus stops are just a few minutes walk away. During the main holiday periods, at certain times, it is possible to get off a modern train at Paignton and cross to the Steam Railway. 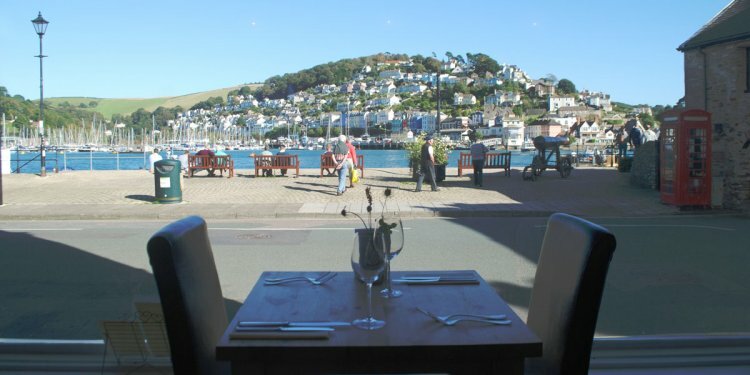 You can then travel the last few miles through breathtaking scenery to Kingswear before crossing the Dart on one of the ferries.
. A delightful pedestrianised street dating from the 1200s. It was built as a dam to hold the Mill Pool. As the water ran out it drove two mill wheels. If you stand about halfway along Foss Street and look towards St Saviour's Church, it is still almost possible to imagine how things might have looked.
. has some of the most stunning views in the country! Probably a monks cell when first recorded in 1192 (it has been rebuilt - in the 17th century.) This church has an interesting collection of brasses and family memorials. Well worth a visit - perhaps by river taxi.
. The Pilgrim Fathers set sail from here in 1620 in the Mayflower and Speedwell (but hit problems and had to goto Plymouth -England until they could continue their journey). Bayards Cove Fort was the last line of defence against any foreign intruders. During the 1970s this area found fame as a setting for TV's The Onedin Line. Dartmouth Museum occupying the first floor of an old merchants house. The collection includes many ship models, pictures and artefacts of this ancient town together with much local and maritime information. about 4 miles outside Dartmouth with an 18 hole Championship golf course (voted one of the top 80 courses in Great Britain & Ireland), a 9 hole pay and play course, driving range plus a superb leisure suite, complete with swimming pool, sauna, steam room, spa, health & beauty treatments, sunbed, gymnasium and physiotherapy clinic. Open daily to non members, handicap certificates not required. Quality ladies boutiques in Dartmouth stock ladies fashion from Quail By Mail, a local working fashion design studio in South Devon. [dead link] The label specialises in quality, artisan and ethical fabrics such as organic and fairtrade cotton, South African shweshwe, Ahimsa peace silk from India and organic tweed from the Ardalanish Isle of Mull Weavers. Quail By Mail manufactures all clothing lines within a 45 mile radius of Dartmouth, empowering the local cottage industry.